Some tips and tricks and a special recipe! Passionfruit peaks: Australian-grown passionfruit is available year round but there are two main supply peaks - summer and winter. Get passionate about health: One serve of passionfruit (two fruits) is a good source of fibre (5g), a source of vitamin C (11mg) and low in kilojoules. Pick plump: Go for plump and smooth fruit that’s heavy for its size – it will have more pulp inside! Bag it: Keep your passionfruit in a plastic bag in the fridge and they’ll last a month! Crack one open: Did you know you can open passionfruit with your bare hands? Simply place the passionfruit between your palms with the stem pointed towards you, clasp your fingers together and push your palms towards each other to break the passionfruit skin. Then pry it open with your fingers and enjoy. Watch out for the juice! Passionfruit pro: Our farmers produce three main varieties of Aussie Passionfruit that are available in store – the purple Misty Gems and Sweethearts, and the large Panamas. Finely chop 200g white chocolate. Warm cream in a heavy-based saucepan until it just starts to boil. Remove cream from heat, add chopped chocolate and stir once. Allow cream and chocolate to sit for one minute, then stir until all the chocolate has melted. Add passionfruit pulp, vanilla, salt, and crushed shortbread biscuits to pan with the chocolate. Stir well, then scrape warm mixture into a shallow dish and refrigerate for 3 – 4 hours until firm. Scoop the passionfruit chocolate onto a baking paper lined tray. Use clean hands to roll into balls. Refrigerate the formed truffles for 1 hour. Melt extra white chocolate (in the microwave or in a bowl set over a pan of simmering water) and drizzle over the cold truffles. Sprinkle with toasted almonds and coconut before the chocolate sets. Store truffles in a covered container in the refrigerator for up five days, serve at room temperature. 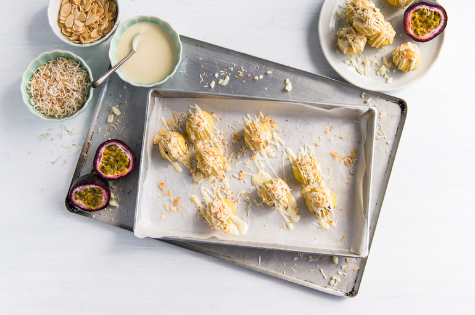 Thank you to Australian Passionfruit for providing us tricks and tips as well as a passionfruit recipe perfect for the holidays!